This is a cartoon I found somewhere – it sort of sums things up don’t you think? 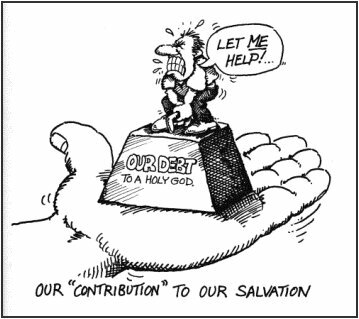 Those who think they contribute to their own salvation by accepting Jesus, doing something such as being good, evangelising, etc, deciding to follow Jesus or whatever – this cartoon shows what you are trying to do, as well as showing how ridiculous your efforts are. Clearly salvation is of grace or there can be no salvation! Well, it had to happen and now it has. It would seem that American gimmicks-style Christianity has now well and truly reached Australian shores. An Australian Anglican Church in Stroud (with a rich history) has begun to hold services in the local pub ~ not that the building itself is the wrong place to hold church services. However, an argument could be made about the ‘appearance of evil’ I suppose. In this case however, the patrons of the pub (or church) will be able to have their beer while attending church. All of this is meant to get more people along to church – to get people who wouldn’t normally attend to start coming. It all sounds typical of the ‘church growth movement’ type approach to church doesn’t it? Make sure you give unchurched Sally or whoever it might be, what they want and they will come to church. Clearly their are many dangers with this type of approach, including the obvious of letting the world infiltrate the church and the church become ‘polluted’ by the world and its practices. Fairly soon you will be unable to differentiate between ‘Christians’ and those at church who are unsaved. No longer are Christians interested (so it seems anyhow) in being ‘apart from the world,’ ‘from being different to the world,’ etc. Now we must appeal to the world in order to be accepted by the world and to increase our numbers – yet the irony of all this is that no matter how many people still of the world begin coming to church or even attach themselves to the church, the church will still be no bigger than it was. True salvation includes separation from the world and its values, and no attendance of church services without true conversion is worth anything to anyone in the light of what really matters.